As I promised in my last post, here are the easy little handmade votive cups I promised to show you. These were a hit at my last gathering of friends. I made two different kinds; one using the leftover corn kernels from my Indian Corn wreath and one using the corn husks from that same project. *Various sizes of glass canning jars – I found mine at Wal-Mart but Kroger and Dollar General Market have them too. Choose the jar you like and fill it two-thirds full of corn kernels. You could use cabdy corn for this too. 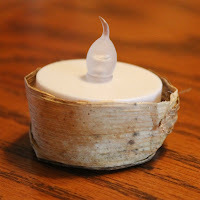 For both projects I tore one left over corn husk into narrow strips and glued a strip around my battery votives - looks so cute!. Tie a little raffia knot around the jar top and you are done! I used Orange and Kraft colored Raffia but any colors you like will be pretty. For this project, I curled the pretty corn husks around the inside of my glass canning jars. I stuffed more husks inside this curled layer to make a place for my battery powered votive to rest. As above, use your Raffia to tie a knot or bow arond the jar. These would be cute on your Thanksgiving table too. I’d love to see pictures of your votives. Send them to Kathy Green and I will post them and give you credit in a future blog post.